First things first; I don’t have dry skin. Secondly, I don’t use body lotion, as a rule. These two facts may be related. I do, however, occasionally get dry shins in winter. I wear trousers a lot, don’t wear a full-length coat for fear of looking like a hobbit, and so my shins, protected only by my trousers and the tights I usually wear beneath are the bits of my body most exposed to the weather, really. There’s always a week, every winter where my shins get so dry and flaky that they ITCH like nothing on earth and it drives me bananas. And still body lotion seems like too much of a faff, frankly. They’re always too scented, or too thick, or just take too damn long to rub in, and I just can’t be bothered. 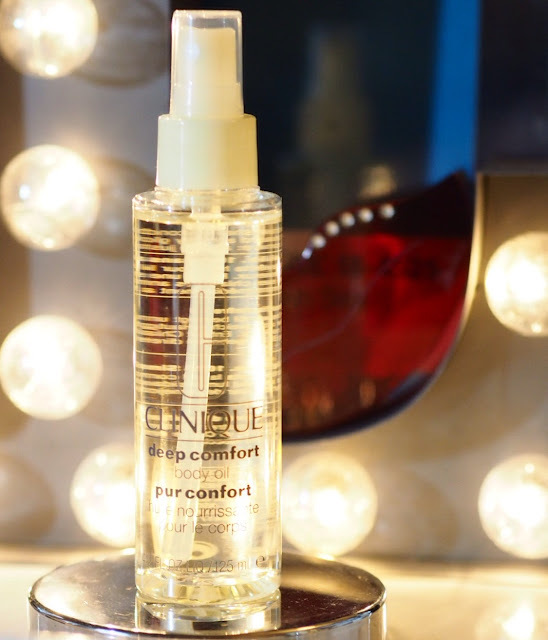 Enter Clinique Deep Comfort Body Oil, a light spray that has just enough heft to be able to hydrate even the most crocodilesque of shins, yet is light enough to barely need any rubbing in whasoever. It literally sinks into skin almost as soon as it is sprayed on, and soothes the itchiest of limbs. I love it. At £21 or so for quite a small 125ml bottle, however, I suspect my drier-skinned friends (of whom I have many) will be cursing at the price. Admittedly you don’t need very much at all, I found one spray per shin plenty to go around. For me, based on two weeks a year usage, and two sprays per shin per day, whilst I doubt I’ll ever finish the bottle in this lifetime, as an emergency itch-relief product, it can’t be beaten.